Small World is inhabited by a zany cast of troops to conquer territory and order to push the other races off the face of the earth. 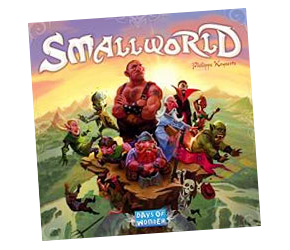 Small World was designed by Philippe Keyaerts as the fantasy follow-up to his award-winning game Vinci. Inside the box there are 2 beautifully illustrated boards that feature different maps for 2, 3, 4 or 5 players, and 14 different races that can each be combined with one of 20 special powers (along with lots of tokens, a special die, and a well-designed token tray). But despite all these options, the gameplay itself is simple and easy to learn. Basically you choose a race and a special power, grab your race tokens, and begin conquering regions on the board. You score coins for the regions you’ve conquered, and can redeploy the tokens you have on the board among them. Later when you run out of race tokens you may choose to put your race ‘into decline’ and choose a new one with a new power. Because there’s limited space on the board, you’ll have to choose just the right time to put your race into decline—you still score regions with your old race, but they can’t use their special power anymore and they’ll probably be quickly destroyed by other players. And everyone is jostling for the limited space in this small world! Picking the right combination of fantasy races and unique special powers, players rush to expand their empires—often at the expense of weaker neighbors. Small World is inhabited by a cast of characters such as dwarves, wizards, amazons, giants, orcs and of course humans. Each race has a special ability—the Giants can more easily conquer mountainous regions, or the Ghouls can continue to conquer new regions even after they’ve gone into decline, for example. There’s a wide range of special powers as well—bonus coins for conquering particular regions, the ability to more easily conquer certain regions, or form brief alliances with other players—that mix things up and keep players on their toes throughout the game. And it’s a game that doesn’t overstay its welcome either; it’s fast-paced, fun and engaging from start to finish. This summary includes all the expansions, including the six player rules. Yep, a bit too much to keep track of now I’m afraid!